Baby Ighodalo Oaikhena is struggling with life at the Inton Hospital, Ogba, Lagos, after his mother gave birth to a set of twins, 11 weeks less than the expected delivery date. While one of the twins died shortly after birth, Ighodalo, who weighed 1.1 kilogramme as of Friday, battled to survive through an incubator and other intensive care systems at the hospital. Doctors at the hospital gave the parents the assurance that the baby had 70 per cent chance to scale the hurdle after 10 weeks of treatment at the cost of N150,000 per week. Looking quite worried, the father of the baby, Samuel Oaikhena, complained to Punch about the burden of paying such heavy medical bills. He said, “My wife went into labour at 27 weeks on February 10 and she was rushed to the Ifako General Hospital, where she was delivered of twins. Unfortunately, we were unable to get incubator space as the available space had already been occupied. The babies were referred to Inton Hospital. “The hospital charged us N300,000 for the twins per week, but one of them died the following day. So, we are to pay N150,000 per week now and he will spend about 10 weeks there. That will cost over N1.5m. Our challenge is fund because there is nowhere I can get the money. I am just a company driver and my wife is a primary school teacher. I have been able to pay N220,000. According to World Health Organisation, about 15 million babies (on the average of one in 10 babies) are born preterm every year, while approximately one million children die yearly due to complications of preterm birth and inability to meet the attendant costs of treatment. Several causes adduced to the gestational deficiency included high blood pressure, being pregnant with twins or multiples, underweight/overweight, vaginal infections, smoking, psychological stress and problems with the uterus, cervix or placenta, among others. Also, Ighodalo’s mum, Roseline, said that when she asked a doctor at the general hospital what could have led to the preterm birth, he had replied that her womb was not wide enough to take the twins. 27-year-old Roseline disclosed that the family had received a total donation of about N120,000 so far. A doctor at the Inton Hospital, Dr. Badejo Christopher, explained that the medical bill was high due to the specialised care required by the baby. He said Baby Ighodalo was being closely monitored by a consultant paediatrician with some level of improvement already recorded. He said, “The mother went into labour at 27 weeks as against 38/40 weeks. The twins were rushed here, but we could not save one of them, a girl. The boy has been inside an incubator and taking drugs. “An average birth weight is 2.5kg, but the baby’s weight at presentation was 1.0kg. 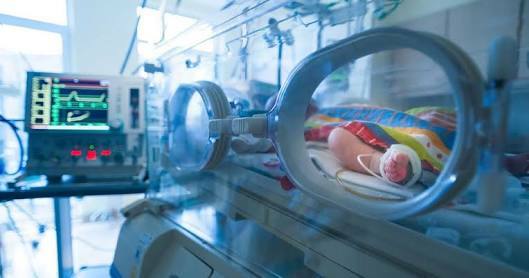 The challenges of managing preterm children are many. The drugs we use are very expensive because the children are susceptible to sepsis (infection). “One of the antibiotics is as expensive as N16,000. We charge N150,000 per week and the baby had spent 34 days today (Friday). We understand things are tough in the country now coupled with the fact that the parents were not expecting something like this. “We told them to make a deposit weekly to sustain the treatment, even if it is N20,000. The total bills will be calculated later. The child is improving and growing, though at slow rate. That does not mean he won’t survive. He has 70 per cent of surviving. He now weighs 1.1kg.